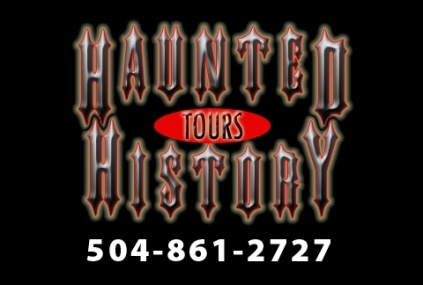 In addition to the usual haunts, New Orleans has some wonderful haunted tours and attractions. While there are many tour companies, I am only listing those with whom I am personally familiar. I know there are a host of good ones and I will add them upon historic and haunted verification and validation. We also have haunted river boats, plantations, a haunted mortuary and more to add some extra sensory spice to your PARANORMAL NEW ORLEANS experience. 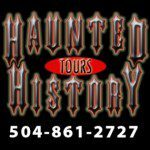 Historic New Orleans Tours - I am most recently recognized for my appearance on the Travel Channels “America’s Most Terrifying Places”. My co-star on that show is Mr. Rob Florence who I feel runs one of the best cemetery tours in town. Together he and I discussed on TV the very scary St. Louis No.1 Cemetery. Many feel that Mr. Florence’s book by the same name is the definitive book on New Orleans cemeteries. If you want to know the historic and anecdotal background of our cemeteries you should take one of these tours. I also recommend their Haunted Tours. My tour guide of choice for the haunted tours is Karen Jefferies. 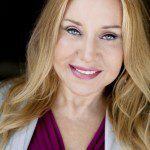 A paranormal investigator with over 15 year’s experience, she will enchant you during the haunted tour with stories of her own paranormal experiences. Haunted History Tours Another tour that I constantly hear raves from clients is the Haunted History Tours. Highly entertaining with knowledgable tour guides that are designed to delite with tales of our most treasured ghostly locations. Other tours available through them too. 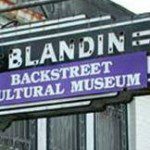 Backstreet Cultural Museum – Perhaps the coolest of the off-the-beaten-path haunted New Orleans destinations, this former funeral home proudly resides in the Treme neighborhood. This museum is the brainchild of photographer and videographer Sylvester Francis. Dedicated to the tradition of African American funeral processions in New Orleans, the museum contains a vast array of memorabilia related to the subject. Housed in an old funeral home, the Backstreet Cultural Museum is the perfect place to relive a true New Orleans haunted send-off. 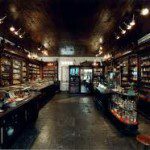 The Pharmacy Museum – This is one of our most curious haunted spots. Before you even have the opportunity to explore the haunted side of this New Orleans landmark, you will be drawn to the displays of the barbaric methods of surgical practice during the early days of medicine. Filled from floor to ceiling with devices and drugs it is easy to see where a spirit might get caught drifting between the ethers. Add to the mix the ghost of the former owner, a sadistic dentist who is portrayed as having a penchant for gruesome experiments, and it’s bound to get scary. Jackson Square – While this majestic central garden serves as one of the most peaceful and beautiful sights in the French Quarter, it must be remembered that this was once the center of public hangings, battles, and bloodshed. In the daytime it seems such a friendly and family oriented place with balloon artists and caricaturists framing the square. When the lights go down a host of very different shadow creatures descend and the vibration shifts back to the wilder days of this frontier town when rules were broken and crimes committed with impunity. Steamboat Natchez – I often sit on my porch and listen to the magic sounds of the calliope from The Steamboat Natchez. I am instantly transported to a time when the Mississippi River teamed with commerce and the whole city was a boom town. The Natchez was launched in 1975 but it brought along with it a grandeur that transcends time. Step aboard and see if you don’t just somehow slip back into the time of the riverboat gambler and southern belle. San Francisco Plantation – This is the site where the most extraordinary paranormal footage taped of me was captured while I was in communication with a spirit named Charles at the San Francisco plantation. I went into a zone or trance and I connected quite emotionally, to the point of tears, with a gentleman entity that had waited many centuries to speak. I wept and spoke through my tears while a giant orb grew behind me. Completely other-worldly, this orb grew larger as our conversation intensified. Once the spirit communication broke the orb became smaller and ultimately disappeared. 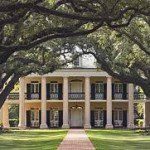 Oak Alley Plantation – The breathtaking beauty of the mighty oak lined entrance to this plantation draws tens of thousands of tourists a year. I was brought in to conduct a paranormal investigation here so my mind was focused more on the macabre. While the interior is absolutely stunning, it hides a sorrow that was not unknown to plantation life. What struck me was the sorrow that I felt in the upstairs rear bedroom. You can connect with the residual energies of the personal tragedies of former owners. Yellow fever, war, and child mortality where just a few of the sorrows that I felt as I channeled an old French lullaby. There are also some joyful spots, on the first floor, which was once a spot for entertaining and displaying the success of its occupants. 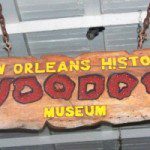 New Orleans Voodoo Museum – Founded in 1972 by Charles and Jerry Gandolfo, this has been the go to spot if you are interested in learning about Voodoo. Taking their calling very seriously, the Gandolfos comprised one of the finest collections of Voodoo artifacts and posess a knowledgeable staff. 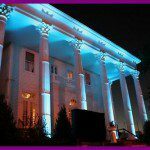 Boutique Du Vampyre –In the city that is the home of “Interview with a Vampire” you can’t have a site about PARANORMAL NEW ORLEANS without mentioning our favorite nocturnal residents – the Vampires. New Orleans is home to many vampire tours and conventions but we also have a lovely shop where you can purchase all things, except blood, vampyric. 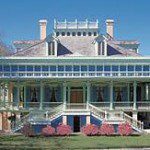 Gray Line Katrina Tour – It is hard to imagine the devastation visited upon New Orleans by Hurricane Katrina. I highly recommend taking a tour that will bring you to the areas of most loss and fatality. Some areas of the city still look like a ghost town with abandoned building that list, on the front of the house, the number of bodies found in that house. I recommend this one for the true paranormal enthusiast.